After that we create a class called GUIFramework, which is the class that will be used to great the GUI elements in Tkinter and uses the Tkinter frame class as its base. For now all the work that we do is done in the __init__ function. To display ourselves we use the grid geometry manager, the grid geometry manager is a straight forward way to display widgets and position them. Since we have no other widgets in this example the defaults are fine, take a look at example two for for information on widget placement using the grid function. 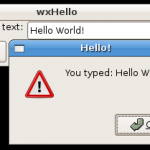 Next is the process of creating the HelloWorld label widget, which is a member of the GUIFramework class, and setting it to be visible. It’s a good idea to make your widgets members of the class in case you need to access them later, but if you’re sure that you’ll never have to access them later, you can just create them locally. Next I’ll show you a more complicated example, I won’t go into specifics with this one since it’s still pretty simple. But if you have any questions about the following code feel free to ask via a comment. If you like this post remember to digg it. a gui messagebox and then use the normal console commands in my script ? I’m not exactly sure what you mean by console commands? Do you mean something like outputting text to the command line (or console)? If so yes it is totally possible to mix both commands. 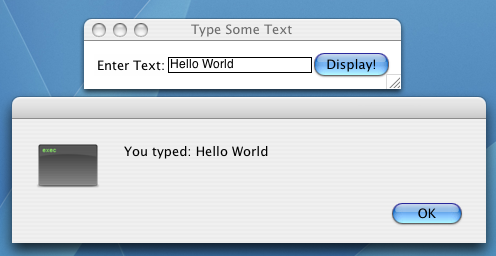 You could definitely have a console application that displays a message box from time to time. There is nothing, that I know of, in python that would stop you from doing this. A (hopefully not) dumb question….. I am trying to save the test typed into the “Entry” field to a file. How would I “capture” that text in a variable? That would set myvariable to be equal to the contents of the entry field. you very good in writing. write more! I wish to create a dropdown with Tkinter. Is it possible? your website tutorials are really good. Could you please tell me where I can find a complete tutorials to Tkinter. It would be quite helpful for me as i am a beginner in GUI building using python. Very nice job introducing gui in python, simple and helpfull. Is it possible to have a hyperlink in the webpage and upon clicking the said hyperlink the tkinter will appear? if so, then how could it be done? thanks in advance for the reply.. I don’t think it’s possible. It may be and I just don’t know about it. But it seems as though that’s a mix or server and client stuff. I am learning Python through “Think Python an Intro to software design” by Allen. I am now in Chapter 3. This book is based on v2. * and there is already a v3. However, the book has footnotes regarding some changes in v2, so I decided to use IDLE for v3. Since I am interested in GUI programming in Python, I was disappointed when Example One code did not run in IDLE v3. I need your advise whether to use v2 of IDLE and learn later the v3. I just found out. It’s tkinter and no longer Tkinter. How about if I wish to add 2 textboxes instead of just one? I know how to create them, connect them, but what can I do con concatenate the contents of 2 or more text boxes? I ran the Hello World GUI example (in IDLE3) and it worked fine but when I closed it the window disappeared but I didn’t get a new prompt in the python shell and when I tried to run it again I got a popup warning me that there was a script still running plus the following text in the python shell. Hope this saves someone else from pulling out their hair. Thnx a lot. This is the best tutorial i’ve found for Tkinter GUI development. Written in a simple way along with the screencaps.. Please check out my website for some great Tkinter examples! 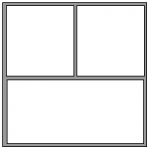 Please check out my website for some great Tkinter learning examples! My name is Wayne Reuvers, and I can make your website UNHACKABLE, GUARANTEED. us now. ?? ???? ?? !